Note: The reconstruction shown below is different than the models described in Barnett et al. (2009), but the gage data, tree-ring data, and methods used are as described in that paper. Figure 1. 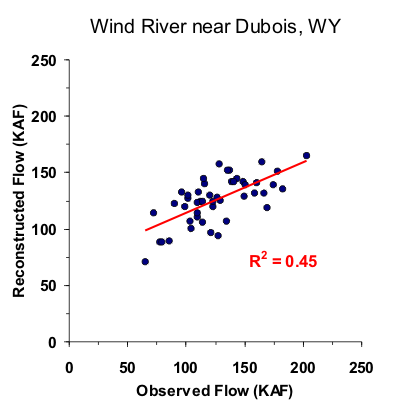 Scatter plot of observed and reconstructed Wind River annual flow, 1946-1992. Figure 2. Observed (black) and reconstructed (blue) annual Wind River annual flow, 1946-1992. The observed mean is shown by the dashed line. Figure 3. Reconstructed annual flow for the Wind River (1560-1992) is shown in blue. Observed flow is shown in gray and the long-term reconstructed mean is shown by the dashed line. Figure 4. The 10-year running mean (plotted on final year) of reconstructed Wind River flow, 1560-1992. Reconstructed values are shown in blue and observed values are shown in gray. The long-term reconstructed mean is shown by the dashed line.